Ok - Lets see now .... where am I again? Latitude identifies how far north or south you are of a baseline – in this case, the Equator which was an obvious choice for early sailors. Measurements are in degrees and range from 0 at the Equator to 90o at either the north or south pole. To differentiate whether were are talking about a position north or south of the Equator, we append the initial “N” or “S” to the degree – ie 42°N. Longitude defines how far East or West you are. Lines of longitude run north/south from pole to pole and are referred to as meridians. Just a we needed a baseline for latitude measurements, so too do we need a baseline for longitude. That however, was not so easy. There is no “natural” place from which to measure latitude so one had to be arbitrarily assigned. Such 'baselines' were variously assigned to different places. The more familiar would be London, UK (at the Observatory of Greenwich), Paris (the Paris Meridian – also known by the fictional name of the 'Rose Line' of De Vinci Code fame) and the Canary Island of El Hierro. In 1884, The Greenwich Meridian was established by international agreement as the Prime Meridian – zero degrees longitude. To differentiate whether were are talking about a position east or west of the Prime Meridian, we append the initial “E” or “W” to the degree – ie 079°W. As the maximum longitude is 180°, degrees of longitude are always written as three digits with zero being used where the degree measure is less than 100. When using latitude and longitude, we need to be quite precise. A degree’s difference in latitude is about the distance from Chicago to Milwaukee or Kincardine to Tobermory, so, for more precise position fixing, this needs to be broken down into smaller divisions. Each degree is therefore divided into 60 minutes (written 60'), and minutes are quoted to as many decimal places as you need. Minutes can also be divided into seconds instead of using decimals. For example, the latitude and longitude for the cardinal marker buoy marking Chickenolee Reef is 41° 42'.91N 082° 36'.867W . This notation defines the position to the nearest one hundredth of a minute (0'.01) which is about 20 metres distance on the surface of the earth. This would be considered accurate enough for navigating. Positions are plotted on a navigation chart. These are printed on a heavier paper to withstand erasures and repeated markings. Charts are printed with North upwards, so latitude (giving North-South position) is marked down the sides of the chart and shows how far up or down the chart you are. Longitude (giving East-West position) is marked along the top and bottom edges and shows how far across the chart you are on an east-west axis. Measurements of distance are ALWAYS taken from the latitude scale. The reason for this is that lines of latitude run parallel to each other and the latitude angles give virtually constant distances wherever you are on the earth. Longitude angles do not give constant distance measurements because the meridians get closer to each other as you move away from the equator until they merge at the poles. The standard unit of measurement is a nautical mile (nm) which is defined as 1 minute of latitude (1 sixtieth of a degree). Navigators find it convenient to measure distance using a unit that relates closely to the measurement of position. The unit they use is a nautical mile and it is defined as one minute (1 sixtieth of a degree) of latitude. On land, we are used to using either statute miles or kilometres to measure distance. However, these units do not work with the Mercator projection used on nautical charts. But, a nautical mile, being equal to a minute of latitude, means that any distance on a chart can be accurately measured, using the latitude scale on the sides of every chart. For comparison, 1 nm = 6, 076 ft or 1.15 mi; 1,852 m or 1.852 km. 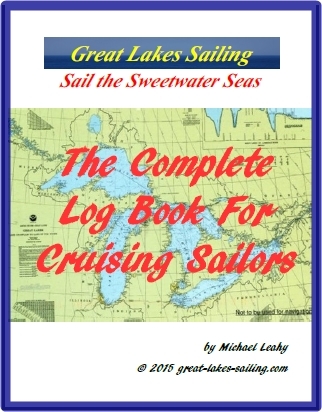 On Great Lakes Sailing's site, all distances are given as nautical miles and, where appropriate, the equivalent distance in miles and kilometres will be noted. Another instrument on board is a LOG or a KNOT METER. A log measures the distance you have travelled through the water, giving a simple reading of nautical miles. From this, you can calculate the speed at which you are travelling, displayed in knots. On land we are used to saying x miles per hour or y km per hour. A marine unit of speed is a knot or nautical mile per hour. The word 'knot' already implies per hour so it is redundant (as well as sounding amateur or silly) to say knots per hour.